The first such committee was organized by none other than Samuel Adams. Working with rural patriots, Adams enabled the entire Massachusetts citizenry to have access to patriot text. In fact, Adams knew that the residents of the seacoast towns were more informed of each crisis than those of the interior. The spread of these committees across urban centers happened quickly. Adams and others urged the establishment of correspondence committees in rural inland towns as well. The Committees of Correspondence were bold enough to use the British postal service as the means of communication. For the most part, the pen was their weapon of choice, but revolutionary sentiment did at times take other forms. For example the Committee of Correspondence in Boston gave its blessing on the raiding of the Dartmouth and the destruction of its cargo that became known as the Boston Tea Party. As the revolution drew nearer, the committees became the spine of colonial interaction. The Virginia House of Burgesses followed Adams' lead and established a Committee of Correspondence as a standing committee in 1773. Before the Tea crisis had passed, each colony had a central committee designed to coordinate discussion with the other twelve colonies. In effect, these Committees of Correspondence were the forebears to the First and Second Continental Congresses. Successful national organization must begin locally. Congresses and national coordinated actions do not materialize out of thin air. Without the work of thousands of local patriots — north and south, urban and rural — there can be no unified result. The Committees of Correspondence became the building blocks on which national unity could begin to build its foundation. Part of the reason Samuel Adams was so effective in building the Committees of Correspondence is because he was a fine journalist. 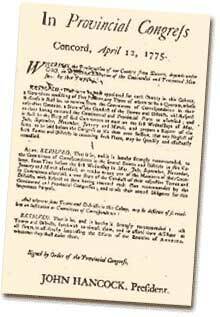 This page examines Adams the journalist and his influence on Colonial Society. This page is written for academia, has no pictures, and is pretty tough going at times. But if you're interested in learning a new side of Adams, this is a great place to come and check out the man whose "editorial fervency moved a generation." This page, devoted to Committees of Safety, was written by a Professor in 1904 and was intended for the serious history student. If that's you, and you want to get a deep understanding of what these committees were all about, who served on them, and how they went about their business, then gallop to this site now. Remember: Safety First! This report of the Boston Committee of Correspondence was prepared by Sam Adams and read to the Boston Town Meeting on Nov. 20, 1772. The inflammatory piece, written by the known radical and master propagandist, is a window looking into Revolutionary Boston four years before the Declaration of Independence. Among the natural rights of the Colonists are these: First, a right to life; Secondly, to liberty; Thirdly, to property; together with the right to support and defend them in the best manner they can. Sounds a bit like the Declaration only it was written by Samuel Adams to the Boston Committee of Correspondence in 1772.